With so many mobile technologies in the Digital Marketing space, it can be hard to keep track of the ever-increasing number of related acronyms and terms they bring with them. Tealium is here to help you define and understand OTT from IoT and SDKs from APKs. Acquisition Tracking is a method that allows app vendors to track the success of their advertising campaigns to encourage users to install their apps. When companies advertise their apps, they can add special tracking parameters to the link in the ad, which will allow the app developer to retrieve this information once the user has installed the app. This data can then be sent to an analytics tool or other Business Intelligence (BI) tool for analysis. How this relates to Tealium: Tealium provides Acquisition Tracking modules for Android and iOS. Tealium can also send data to 3rd party acquisition tracking solutions, such as Adobe Analytics, Tune, Kochava, and others. How this relates to Tealium: Tealium provides an Angular integration for Tealium iQ Tag Management. An APK (Android Application Package) file is the file format used to distribute Android apps. It is similar to a ZIP file and contains all the code required to install and run an Android app. Users generally don’t use APK files directly since legitimate apps are usually installed directly through the Google Play store. If you are testing new releases of an app, developers will sometimes share APK files with you to install on your device before the app is published to the Play store. How this relates to Tealium: Marketers will often receive test builds of their apps in the form of APK files from app developers to test their Tealium Mobile SDK deployment. The application lifecycle refers to how the app “lives” on the user’s device from the moment they launch it, to the moment it closes. At the most basic level, the four most important states in the application lifecycle are Launch, Terminate, Background (user switches to a different app, or the home screen) and Foreground (user switches back to the app after it was previously put into the background). Some analytics tools provide reports based on the application lifecycle and the metrics that are derived from these events, such as the total time the user spent in your app. How this relates to Tealium: Tealium’s mobile SDKs for Android and iOS all contain a lifecycle tracking module, which enables automatic tracking of lifecycle events and their associated metrics. A beacon is a Bluetooth Low Energy (a.k.a. BLE/Bluetooth Smart) device used primarily for fine-grained indoor location and proximity tracking. Beacons broadcast a permanent hardware identifier via Bluetooth, which can be picked up by nearby Bluetooth-enabled devices to help them determine their location in relation to a specific point of interest. Beacons may also be referred to as “iBeacons”, which is Apple’s trademarked name for the beacon protocol supported by Apple devices. The Google equivalent is the Eddystone protocol. Beacon hardware distributors generally support both Eddystone and iBeacon™ across all major platforms (Android, iOS and Windows). Whenever an app terminates unexpectedly, it is said to have crashed. Crashes usually occur due to bugs in the app’s source code, which can be difficult to track down, and are not always reproducible across all devices, especially on Android, where there are many different device manufacturers. Crash Tracking provides the developer with insights into why their code crashed the app, usually down to the exact line number. This information can be invaluable in improving the quality of apps and reducing user frustration. How this relates to Tealium: Tealium provides optional crash tracking capabilities for Android and iOS. Cross-platform frameworks are designed to reduce the amount of code required to support multiple different operating systems and devices for the same app. They allow organizations to make use of their developers’ existing skill sets to build native apps, which has noticeable speed and cost reduction benefits. The majority of the code written can be used across all the major platforms, with only a small quantity of platform-specific code required (or none in some cases). How this relates to Tealium: Tealium provides integrations for all the major cross-platform development frameworks. See our Integrations page for more details. The Data Layer in a mobile app follows the same principles as the data layer for traditional websites. It provides a standardized set of data about the actions the user is taking in your app. It should have clear and meaningful key names that can be understood by technical and non-technical users alike, for example, “screen_name”, “hashed_user_email”, “order_id”. Defining a good data layer right at the start of your app development will reduce the need for future code updates when analytics requirements change. There is no such thing as “too much data”; it can be filtered out later on if not needed, but it is much harder to add later on if it’s missing. How this relates to Tealium: The Data Layer in your mobile app can be used to trigger actions in Tealium iQ and/or UDH. Deeplinks are special hyperlinks that can directly link users to a specific part of your app (for example, the “My Orders” section of an ecommerce app, or maybe a special offer). How this relates to Tealium: Deeplinks can be tracked using Tealium’s event tracking methods available in our various SDKs. Any service that gives the user the ability to pay for products or services with their mobile device, without needing credit cards or cash, such as Apple Pay, Android Pay and Samsung Pay. How this relates to Tealium: At Tealium, we often hear Firebase referred to as a single product, and usually, this is in reference to either Firebase Cloud Messaging (FCM) or Google Analytics for Firebase (formerly Firebase Analytics). Tealium provides integration options for both FCM and Google Analytics for Firebase. Geofencing allows developers to set a virtual “fence” around a specific geographical area so an action can be taken when the user enters or leaves that area. As an example, some smart home devices/apps use geofencing to determine whether a user is currently at their home address, and some retailers use it to determine if a user is near one of their shops to potentially target users with special offers to encourage them in. How this relates to Tealium: Tealium’s UDH can use geofencing data to trigger actions and connectors. For example, a push messaging connector when the user is near a defined point of interest. An app that is mostly written in native code, but also includes some web components (for example, the checkout flow of an ecommerce app may be implemented in a Webview, while the rest of the app is native). An app written using one of the previously discussed cross-platform frameworks, such as Cordova. The “Internet of Things” is a general term describing any device connected to the Internet, including cars, wearables, security systems, smart plugs, smart light bulbs and an ever-increasing number of other devices. How this relates to Tealium: Tealium has SDKs and open APIs that allow Tealium technology to be integrated with most internet-connected devices. Similar to an APK file for Android, an IPA (iOS App) file is Apple’s distributable file format that contains the code required to install and run an iOS app. Users do not regularly use IPA files directly since apps are typically installed through the Apple App Store. Occasionally, developers may distribute IPA files directly to users for testing before release, which can be installed through iTunes. How this relates to Tealium: Marketers will sometimes receive test builds of their apps in the form of IPA files from app developers to test their Tealium Mobile SDK deployment, which can be installed through iTunes. Machine learning involves using special computer algorithms to make predictions on data based on some prior knowledge of similar data sets. Most Machine Learning algorithms continually adapt and adjust their predictions each time they receive new data and can be very powerful to digital marketers. Mobile Backend As A Service refers to any product providing centralized, core app backend services that would normally be hosted by the app vendor themselves. Examples include databases, push messaging, crash reporting, messaging, authentication and file storage/hosting. How this relates to Tealium: Tealium can integrate with many MBAAS providers, such as Google’s Firebase. In-app personalization is used to give each app user a unique experience, usually based on information gathered through analyzing their past behavior. How this relates to Tealium: Tealium’s AudienceStream, part of the Universal Data Hub, provides access to the visitor profile of a known user, via Data Layer Enrichment, which can be used to personalize the user’s experience based on their previous behavior through any channel (web, offline, mobile app). This term describes any company who prioritizes the experience of their mobile device users over traditional websites. In many cases, mobile-first companies do not offer a web-based user experience at all and only offer a mobile app. In theory, this allows them to focus on delivering the best possible mobile app experience. This trend appears to be common in the banking sector among new banks, who are challenging the traditional banking institutions by focusing on new technology and customer service and pitching their business to the younger demographic. This is a Tealium term for the remote configuration options that allow you to change the behavior of the Tealium SDKs on-the-fly, after the app has been deployed to the app store. This can be useful to enable and disable features of the SDK as and when you need them, if, for example, you add a new Tealium product to your license agreement. Mobile Tag Management refers to client-side (on-device) delivery of analytics/advertising tags, in a similar way to a traditional website. Data is collected from your data layer on the user’s device and sent directly to 3rd party analytics/advertising vendors. How this relates to Tealium: Tealium iQ is Tealium’s Tag Management solution and can be easily deployed on Android and iOS using our mobile SDKs. Using Tealium iQ Tag Management in your mobile app can save a significant amount of time in deploying analytics and other data collection technologies, and can reduce the overall resource footprint of your app, because fewer 3rd party SDKs are required. Any app written wholly in code native to the platform/operating system it is running on. For Android, Native Apps can be written in Java or Kotlin, while for iOS, they can be written in Objective-C and Swift (and occasionally in C/C++), and for Windows, they are written in C#. How this relates to Tealium: Tealium has support for all the major platforms through our native SDKs. A term originally coined by Estimote, Inc. to describe everyday objects that are tagged with a variety of low-power sensors, usually equipped with Bluetooth Low Energy (BLE) technology, allowing nearby devices to get contextual information about that item (such as approximate location). Mobile devices communicate with Nearables using Apple’s iBeacon protocol, or Google’s Eddystone. In a retail context, the nearable technology could be used to give customers more information about the physical products they are looking at in a shop, while using an app on their smartphone. How this relates to Tealium: Tealium’s Universal Data Hub can use the data provided by Beacons/Nearables to give your user a hyper-personalized in-app experience. Objective C is one of two major programming languages available for developing iOS applications. Bonus fact: Methods (function calls) and data types in Objective-C are prefixed with the letters “NS”, which stands for “NeXTSTEP”. This was, initially, to allow NeXTSTEP to extend the Objective-C language, while maintaining compatibility with older Objective-C code, as a simple form of namespacing (a feature lacked by Objective-C in general). How this relates to Tealium: Tealium has an SDK for Objective-C based iOS, tvOS, and watchOS apps, which can help you easily integrate Tealium. Over-the-top refers to any digital media service delivered over the Internet, as opposed to conventional methods, such as satellite and cable. It can also be applied in a telecoms context to refer to messaging or voice services such as Apple’s iMessage or WhatsApp, which are delivered by a 3rd party, independently of the cellular network provider. How this relates to Tealium: Tealium has SDKs for many different OTT devices, such as Roku, Android TV and AppleTV. Other devices can make use of our generic HTTP API. Similar to Volatile Storage, but more permanent; persistent data refers to any data stored on a device’s hard disk, and available for future app launches once the app is closed. How this relates to Tealium: Most of Tealium’s SDKs provide a persistent storage API, which automatically sends all persistent data on each tracking call. Push notifications make use of services provided by mobile operating systems to send a message directly to the user’s device. Because the operating system handles the messaging itself, a push message can be sent and received at any time, even when the app isn’t running. How this relates to Tealium: Tealium has integrations with many of the market-leading push messaging providers, allowing you to target your users with particular messages based on the information held about them in the Tealium Universal Data Hub. The terms SDK (software development kit) and Library may be used interchangeably. SDKs are packages of software distributed, usually by a 3rd party vendor, to allow an app developer to quickly implement functionality they would otherwise have to develop from scratch. Any technology capable of reducing the total number of 3rd party SDKs in your app. 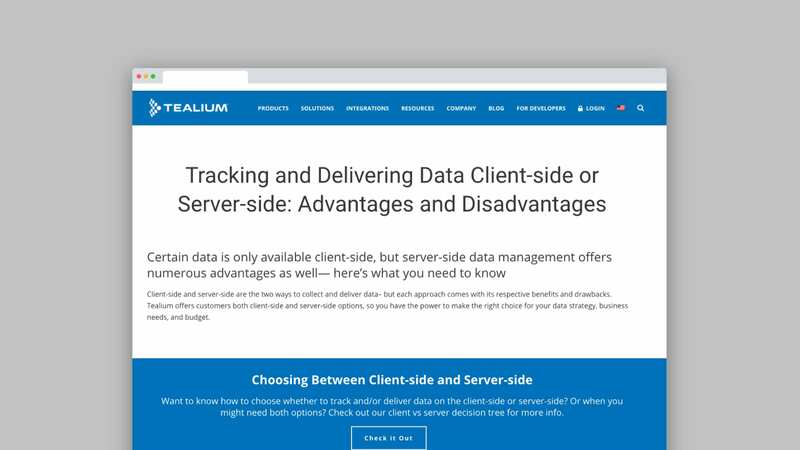 How this relates to Tealium: Tealium can to integrate with several 3rd party marketing technology and analytics vendors, without the need to include their native SDKs. This reduces the amount of tracking code your app developers need to implement and will save a lot of time in future app releases, so you don’t have to worry about upgrading 3rd party SDKs. Some vendors require their SDK to be present in the app to support all available functionality in their products (e.g., Push Messaging). SPAs comprise a single HTML page that updates dynamically as the user interacts with them. Popular SPA frameworks include Ember.js and Angular. ReactJS has some commonalities with SPA frameworks, and may be used as part of an SPA, but isn’t an SPA framework in its own right. Swift is Apple’s newest programming language, designed from scratch by Apple engineers. Swift was introduced in 2014 and designed to succeed the Objective-C language as the de facto standard programming language for building applications for Apple’s various platforms, including iOS, tvOS, watchOS, macOS and macOS Server. It is quickly replacing Objective-C due to its open-source codebase, and accessible and easily-understood syntax. Swift and Objective-C can happily coexist inside the same app and are fully interoperable, which allows app developers to slowly to migrate their code over time slowly. How this relates to Tealium: Tealium provides a Swift SDK which supports Tealium’s UDH and Tealium iQ products. This term is specific to iOS app development but is often also extended to other platforms to describe swizzle-like behavior. Swizzling is a feature of the Objective-C runtime (the main “control center” that allows native Objective-C based apps to run on your iDevice), which allows specific default functionality to be switched dynamically at runtime for new functionality. Some 3rd party analytics SDKs use this method to provide a quick and easy way of implementing their SDK without requiring specific code to be written by the app developer (for example, to send the Push Notification token to the vendor’s server). Swizzling can be risky, and we recommend avoiding it. How this relates to Tealium: Tealium recommends App Tracking requirements are carefully considered, and explicit calls to the Tealium API are made whenever a user’s action needs to be tracked, rendering Swizzling unnecessary. A tracking call is a piece of code designed to call the Tealium tracking API, or any other 3rd party API designed to collect information from your app. Usually a tracking call will consist of a “dictionary” of key-value pairs containing metadata about the interaction being tracked. How this relates to Tealium: Tealium APIs all provide simple tracking methods/functions to allow data to be transmitted to Tealium’s UDH or used client-side in Tealium iQ for firing tags and extensions. This refers to a way of temporarily storing data while an app is running that will later be destroyed when the app is closed. An example would be a session ID that changes each time the user launches the app. How this relates to Tealium: Tealium’s SDKs all provide a Volatile Storage API, and all volatile data is sent on every outgoing tracking call sent via the Tealium API. That is then merged with any additional data you provide to the tracking call. 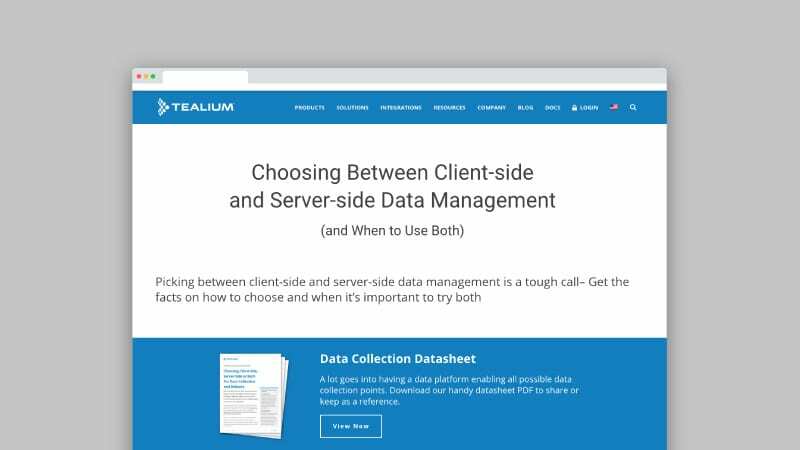 How this relates to Tealium: Tealium’s SDKs for Android and iOS offer remotely configurable options to send data to Tealium Eventstream and AudienceStream on a background thread and/or run Tealium’s Tag Management service in a non-rendered webview). Tealium’s Learning Community Article on General Mobile Concepts.